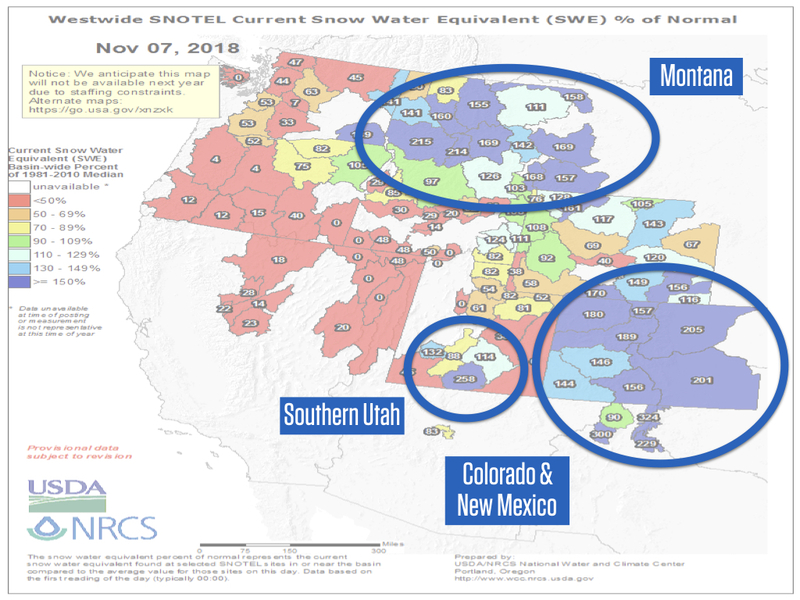 The amount of snow on the ground is up to twice the average amount for early November and Colorado is leading the western US in terms of snowpack. Coming up, look for cooler weather Thursday, dry and warm conditions Friday and Saturday, then light snow and cold air will return on Sunday and Monday. 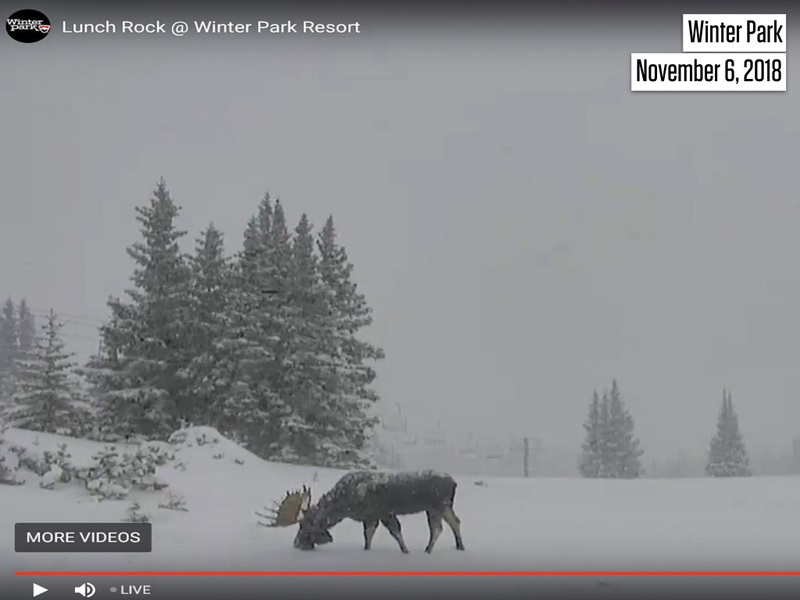 The webcam near the summit of Winter Park caught a moose getting first tracks in the pow during the latest storm. A reader in Breckenridge also sent me a beautiful picture of a moose in the fresh snow and I’ll post that on Friday. We are well above average for this time of year. The numbers in the map below show the percent of average snowpack, with blue colors indicating above-average conditions. Colorado, southern Utah, and Montana are showing the best numbers as of November 7, 2018. 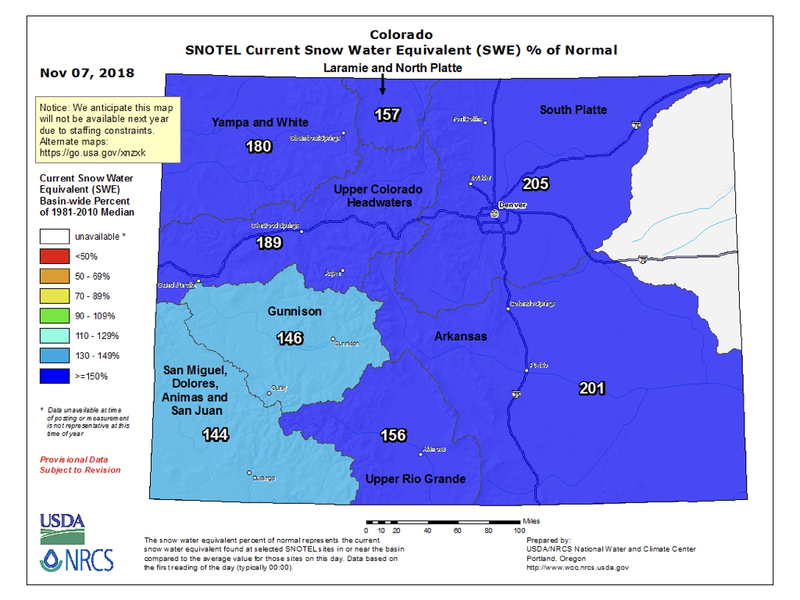 Zooming into Colorado, all of our river basins are reporting 140-200 percent of average snowpack. There is no guarantee that we’ll keep these numbers through the season, but we’ll take the strong start! Backcountry - lots of snow, lots of wind = fun skiing AND avalanche risk. There have been avalanches reported every day of the past week. Please make good decisions and keep your eye on CAIC! A weak storm will brush by the northeastern corner of Colorado. The main impact of this system will be additional clouds over the northern mountains, light snow showers with minimal accumulation, and colder temperatures. Sunny, dry, and warmer with highs in the upper 20s to mid-30s. Enjoy! This system still looks on track to deliver a few inches of snow over the northern and central mountains, with perhaps 4-8 inches east of the divide. The snowfall map hasn’t changed much from yesterday. 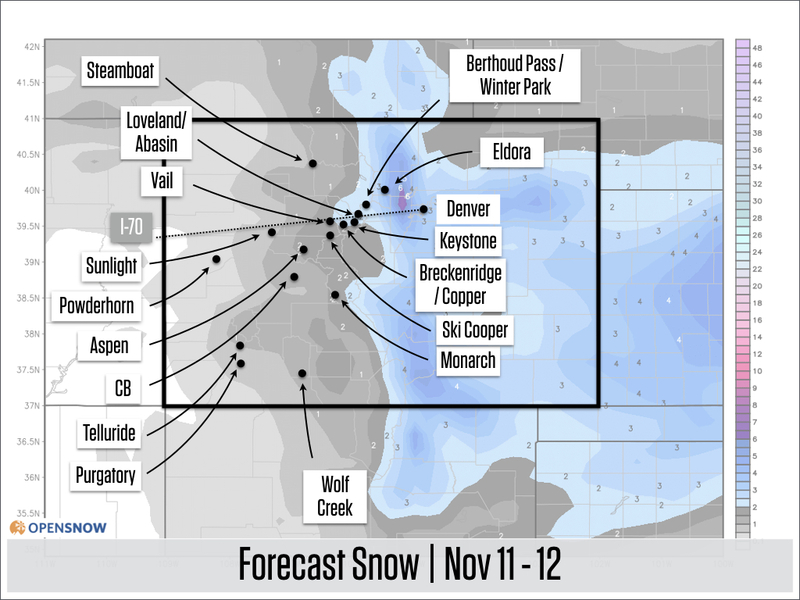 And the range of forecasts for the Loveland / Arapahoe Basin area continue to show lower-end totals, with an average of 2-4 inches. 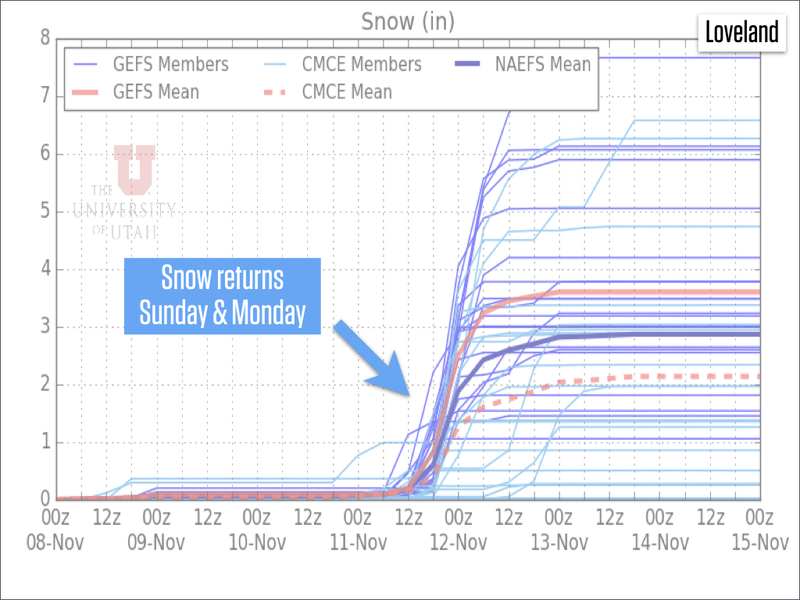 Expect the snow to begin Sunday midday and continue through Monday midday. And for temperatures, this system will bring very cold air with readings on Monday likely staying in the single digits to teens. * Maybe a weak system around Thursday, November 15. The main impact could be cooler temperatures and right now snow potential is minimal. * The weekend before Thanksgiving into early Thanksgiving week shows generally warmer and drier weather, though a few models hint that we could see a storm early in the week. * End of November. Like I said yesterday, the storms that we’ve seen in early October and early November have been on a 3-4 week cycle (this relates to the MJO). 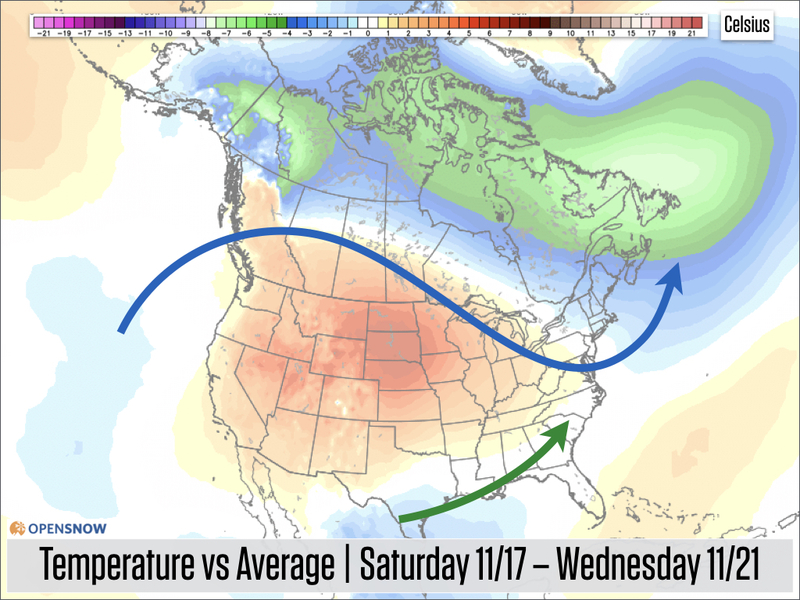 If past trends hold, then we may be in for a drier period during the middle of November with stormier conditions possible late in the month and into early December. Remember that forecasts beyond 7-10 days are mostly inaccurate, so I’m only trying to give a general sense of what I’m seeing rather than an absolute 3 week prediction. My next update will be on Friday, November 9. PS - If you’re coming to my talk in Breckenridge on Friday, please see below as the venue has changed! My upcoming presentations about the winter forecast and tips for chasing pow! * Thursday, November 8 in Evergreen at Boone Mountain Sports / Evergreen Brewery. Free to attend. Beer and food available for purchase, and the talk starts at 7 pm. Details here. * Update Location! Friday, November 9 in Breckenridge at the Riverwalk Center. Party, my talk, and a movie. Time from 500-830pm. Please get your free ticket here. * November 28 in Vail at Walking Mountains Science Center. Free to attend. The talk starts at 630pm. Please RSVP here. * December 5 in Denver.